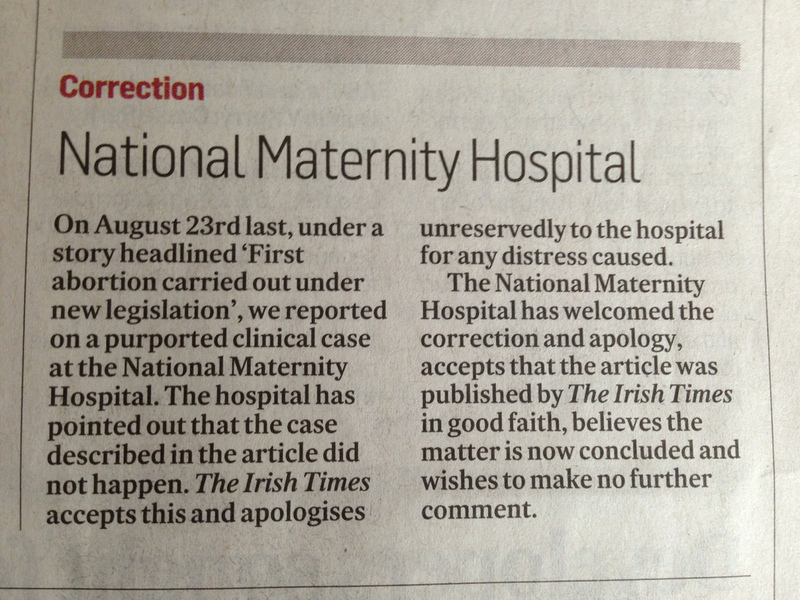 Home / General / The Irish Times, terminations and Holles Street: The story that wasn’t there. 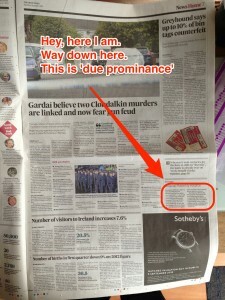 On the 23rd August 2013, the Irish Times broke a story on Page One. It described a medical crisis in a woman’s pregnancy which resulted in the termination of that pregnancy to save her life. It gave a lot more detail than I have given here. In fact, it gave so much detail that the woman who had experienced that crisis would have been clearly identifiable. The only excuse that could be offered for this intrusion into a family’s private experience was that this was the first termination made under the new Protection of Life during Pregnancy Act. This would be a pretty threadbare excuse if it were true. It quickly turned out that it was not true. The commencement order for the Act hadn’t been signed yet. So the Act wasn’t law yet. Signing a Commencement Order is not a secret event, you understand. You can just look at this page and see if it’s happened. So, what did the Irish Times do when it discovered that the thin reed of newsworthiness it had relied on to justify breaching the medical privacy of a citizen was gone? Did it issue an apology or retraction? Not at all. It sent the journalist who wrote the piece out to give this interview (Interview starts 7 minutes in). Or you can read a partial transcript here. So, even after he acknowledged the primary legal claim of the article was incorrect, the author continued to insist that the story was in the public interest. And, by implication, that public interest was sufficiently significant to overcome a woman’s expectation that her medical records won’t become public knowledge. What that public interest might have been is left unexplained. Here’s something that might surprise you: I don’t hold the author primarily responsible for this. If a reporter approaches an Editor with a story, it is the Editor’s job to act as the filter. It is the Editor’s job to insist that the story be properly sourced (more than one anonymous source, if possible. All available facts confirmed, definitely). Then it is the Editor’s job to decide whether the story is really in the public interest to run. And finally, if the story falls apart, it is the Editor’s job to explain to his or her readers how it came to be on the front page in the first place. Knowing this woman and her family had to experience having this published distressed me. I doubt I was alone in this. A significant number of pregnancies every year are not carried to full term. I thought it was one of the most reprehensible failures of Editorial judgement that I’d ever read. But then, today, we reached the last twist in this sorry tale. 1.1 In reporting news and information, newspapers and magazines shall strive at all times for truth and accuracy. 1.2 When a significant inaccuracy, misleading statement or distorted report or picture has been published, it shall be corrected promptly and with due prominence. 1.3 When appropriate, a retraction, apology, clarification, explanation or response shall be published promptly and with due prominence. the article hasn’t been touched since 8.15am on the 23rd August. So who knows what you may get if you click on this link in the future. 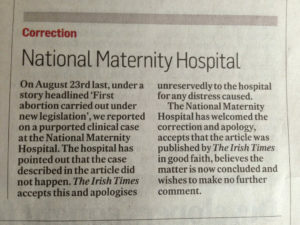 When we make a correction, we try to make it as clear as possible to users of irishtimes.com that a post-publication change has been made; for the last two years, we have done so with a line at the bottom of the text indicating that this has happened. Recent events show that we need to be even clearer with that message, always including the date that the change was made, the reason for making the amendment and, where possible, marking the changed text. And here is the Irish Times’ Editor, Kevin O’Sullivan, setting out the standards by which he wishes the newspaper he edits to be judged. We are conscious of our power and responsibility when we deal with issues or events that touch upon the private lives of individuals. We try to act sensitively at times of stress and trauma, and we do not exploit the vulnerability of individuals. I don’t know whether there ever was a woman who met the description given by the Irish Times who suffered a medical crisis during pregnancy. I don’t know why a group of men in positions of authority in the Irish Times decided that, if there was such a woman, they had any right to tell the rest of the country about her experiences. I don’t know why, when they discovered that a mistake had been made in the one legal fact used to justify that decision they didn’t immediately apologise. And I don’t know what happened between the 23rd August 2013 and 31st August 2013 to prompt them to print a shoulder shrugging ‘acceptance’ that the case ‘hadn’t happened’ and limit the paper’s apology to an institution, as opposed to its readers. But, from what I’ve seen this week, I do know one thing. Whatever questions readers might have, The Irish Times isn’t interested in giving them any answers.